Metal fabrication is the creation of metal structures by cutting, bending, welding and assembling processes. It is a value-added process involving the creation of machines, parts, and structures from various raw materials. Metal fabrication usually starts with drawings with precise dimensions and specifications. Typical projects include loose parts, instrument enclosures, structural frames for buildings and heavy equipment, and stairs and hand railings, etc.. Cutting is done by sawing, shearing, or chiseling (all with manual and powered variants); torching with handheld torches (such as oxy-fuel torches or plasma torches); and via numerical control (CNC) cutters (using a laser, mill bits, torch, or water jet). Here several tools like notches, punches, lasers, plasmas, shears and saws are used. Bending is done via press brakes, tube benders and similar tools. Modern metal fabricators use press brakes to coin or air-bend metal sheet into form. CNC-controlled backgauges use hard stops to position cut parts to place bend lines in specific positions. Assembly (joining of pieces) is done by welding, binding with adhesives, riveting, threaded fasteners, or further bending in the form of crimped seams. 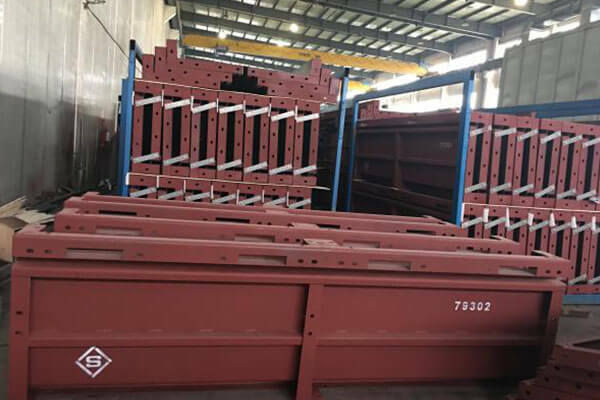 Structural steel and sheet metal are the usual materials for fabrication; welding wire, flux and/or fasteners are used to join the cut pieces. Surface finishing is an industrial processes that alter the surface of a manufactured item to achieve a certain property. Finishing processes may be employed to: improve appearance, corrosion resistance, tarnish resistance, chemical resistance, hardness, remove burrs and other surface flaws, and control the surface friction. SVEIFAB has the ability to apply any required coating in sets of our heated coatings facilities which meets government environmental requirements. The fabricated steel is cleaned with a spraying line first to remove dirt, grease, mill scale and rust. Coatings vary from powder coating, sandblasting and painting line which is self-owned, and galvanization is performed off site using local businesses. Metal fabrication is the process of turning raw metals into pre-made shapes for assembly use. For example, Electrical enclosures and any type of metal enclosures require sheet metal fabrication. Look around you. Many people never notice it, but many of the products and components we take for granted have some aspect of precision sheet metal fabrication. From desk bracket to construction steel form, and all types of finished products and parts in between start out as sheet metal or heavy steel. The sheet metal fabricator machines punch, cut, drill, bend, shape and assembly metal sheet into an endless number of forms. Although commercial and industrial companies typically use metal fabrication services, they purchase customized metal parts for plants, warehouses, office buildings and other spaces. Some residential homeowners also have a need for customized metal fabrication services. The dimension of the custom metal fabrication project that you need to be completed will have a great influence on the overall cost as larger products will use more labor and materials. From small bracket to huge production equipment enclosure, cost vary widely. The metal used for custom fabrication will affect the price greatly. Metals that are commonly utilized include mild steel, aluminum alloy and stainless steel, and heavy steel. However, depending on the type of project other metals like brass and copper may be used as well. The processes which will be used to design your custom fabricated metal work will influence the price too. Some commonly used processes are punching, metal cutting, bending and welding. The total cost will be influenced too by the number of processes that will have to be carried out. Their complexity will play a role in the total cost of the custom fabrication. The more expertise and experience required, the more expensive the process will be.